Those may be the most disingenuous words ever spoken. Or written for PR purposes in a contrived bio. He must have a crapload of energy, considering how many millions of lives he has impacted by stalling science for 30 years. Why so snarky? Oh, you know, no big deal. It’s just that he and his colleagues from Big Important Government Agencies and Famous Research Institutions continually deny the existence of these diseases of immunosuppression, even though their own research and patents prove otherwise. I don’t know about you, but to me, that looks like he is creating a disease with a fake vaccine for which he’s already created a treatment. And he stands to profit from both. 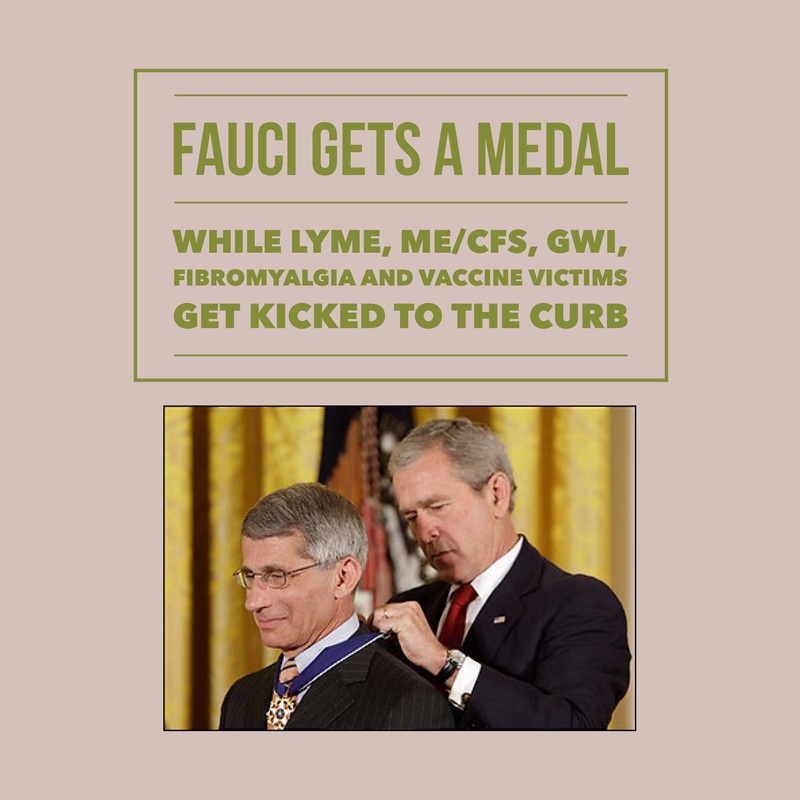 Under Fauci’s brand of leadership, countless millions of us have been kicked to the curb by the medical profession. Gulf War Syndrome (GWS)–buck up, soldier! What they’re not telling you is that the CDC and NIH know what causes these diseases/syndromes/disorders, and for various reasons they don’t want you to know. One would think that with a patented treatment for an illness that’s known to affect millions, Fauci would let us get treated and pocket those royalties in a heartbeat. And one would be wrong. The biggest reason they don’t want you to know the common mechanism of all these diseases is that it betrays the source of the autism pandemic. It jeopardizes the gazillion-dollar vaccine industry. Bill Gates would have nothing to do. Well, they’ve studied it, published about it, and patented it, so the cat’s out of the bag. Meow. No more “post-treatment Lyme disease syndrome” or PTLDS for us! They call it Post-sepsis Syndrome or fungal meningitis, and today is your lucky day! With this four-page document that was prepared by the Society for Advancement of Scientific Hermeneutics (SASH), YOU, the patient, now have a handy, concise guide to what this disease is, and how Fauci, NIAID and NIH suppose it might be treated. It’s complete with citations that even an M.D. can understand. Tired of getting the runaround from doctor after doctor? Take our guide to your next appointment and insist that the abuse stop now! Tell ’em Tony sent you. Tony “The Tiger” Fauci has a long history! Sure does! He knows his stuff!